Love pizza? But need to find an alternative to the doughy variety? I really love this cauliflower pizza recipe. The base is simple and easy to make and you can change the toppings to suit your appetite! Place chopped cauliflower in a microwave-safe bowl. Cover and microwave on high for approximately 5 minutes or until very tender. Drain water out of the container and then process the cauliflower in a food processor until finely chopped. Combine cauliflower, egg, chilli flakes and 1/2 cup of cheese in a mixing bowl. Press cauliflower mixture firmly into the oven tray. Bake for 20 minutes or until golden. 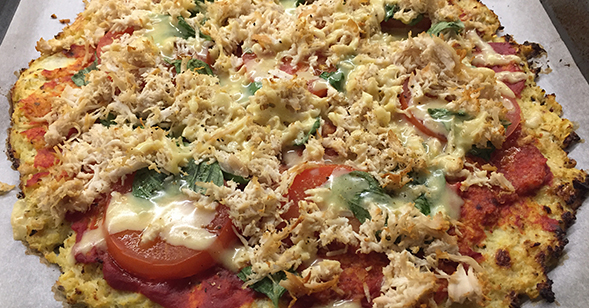 Once out of the oven, spread tomato paste over base and top with basil, chopped tomatoes, chicken and sprinkle cheese over the top. Bake for 7 to 10 minutes.